Here at Yh Studios, its not just a job for us we always try our best to make the most of each picture. Just see the example below. I wasn’t happy with the models t shirt so we took a jacket from another photo which I think you will agree it looks so much better. 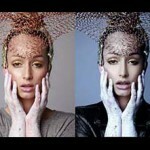 The combination of make up, photography and editing is just a blend that is beyond anything. Previous PostYh Models is growingNext PostGetting all applicants in for our baby jeans shoot. Please apply, last day! !